12.01.1926 The board of Kingston Steam Trawling Co Ltd decided to build two more distant water trawlers to the same design as the ANDALUSITE built by Cook, Welton & Gemmell Ltd (Yd.No.461). Contracts were signed with the shipyard to build the ships at a cost of £8,450 each and with C. D. Holmes & Co Ltd to make the engines and boilers at £6,130 each unit. Total cost £14,625 per vessel. A decision was made to add the Kingston prefix to the existing nomenclature. The names chosen were, KINGSTON DIAMOND and KINGSTON PEARL. The short lived General Strike of May 1926 and continuing Miner’s Strike led to delays in the completion of both vessels. 17.4.1926: Launched by Cook, Welton & Gemmell Ltd, Beverley (Yd.No.483) for Kingston Steam Trawling Co Ltd, Hull as KINGSTON PEARL. 3.6.1926: Registered at Hull (H296) (O.N.149083). 12.8.1926: Completed trials and accepted (John W. Lown, manager). 17.8.1926: Sailed on first trip to Iceland. 9.9.1926: Landed 849 kits grossed £1,108. 14.5.1927: Grounded whilst entering Trongisvagsfjordur, Suderoy, Færoe Islands. Refloated and leaking badly but with pumps coping sailed for Hull. 17.5.1927: Landed and slipped. On survey bottom plating found to be extensively damaged and internals set up. 1938: Laid up with Special Survey due and offered for sale. 20.3.1939: Sold to Soc. Anon Armement Ostendais, Ostend, Belgium for £3,635 without fishing gear and fishroom boards. 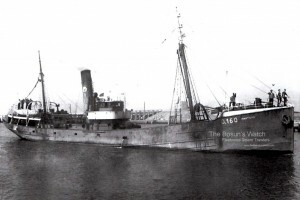 12.4.1939: Registered at Ostend as NAUTILUS (O160). 4.1939: Re measured 42,76 x 7,31 x 3,93 metres – 336.45Brt 129.48n. 5.1940: Escaped to England. Fishing From Fleetwood. 18.5.1940 Arrived at Fleetwood. Transferred to Belgian Economic Mission, London. 17.2.1941: Requisitioned for war service on miscellaneous Naval duties. Renamed JAY. Operated as a controlled minelayer (P.No.M.02). 12.2.1946: Returned to owner. Reverted to NAUTILUS (O160). 10.1946: With surveys outstanding carried out Special Survey at Antwerp. Re classed as a Steam Trawler. 21.12.1946: Homeward from Iceland, cook Arthur-Henri Dehhondy died. 29.10.1949: Chartered by “Weser” Hochseefischerei-und Fischhandels GmbH, Bremerhaven. 28.10.1949: Sailed for Bremerhaven with a Belgian skipper. 9.1950: Sold to Government of Poland, Warsaw (Ministry of Industry & Commerce) (“Dalmor” Przedsiobiorstwo Polowow DalekomorskichSp.z.ogr.odp, Gdynia, managers). 6.10.1950: Registered at Gdynia as PERSEUSZ (GDY111). 2/3.6.1952: During night stranded off Swinemünde in position 54.01,30N 14.20E. Wreck subsequently broken up in situ. Gdynia registry closed. 14/08/2010: Page published. 4 updates since then. 14/09/2018: Removed FMHT watermark from image. 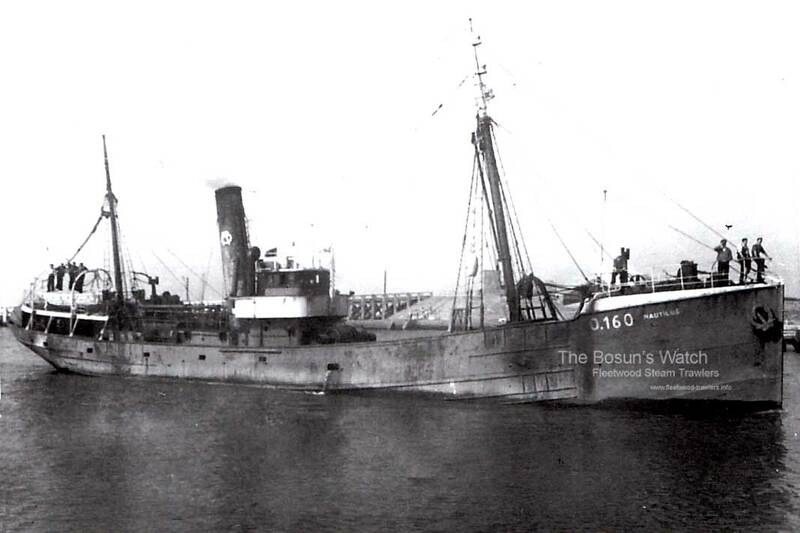 This entry was posted in Lost Vessels, Steam Trawlers, Steamers (Picture), Wartime Visitors and tagged Lost, Wartime Visitor on August 14, 2010 by Fred Smith.